Being invited to the Thanksgiving meal is a gesture of welcome and inclusion in American homes far richer than any giblet gravy- so don’t arrive empty handed. After asking the hostess what you can bring (and picking up an extra bottle of Riesling when they say “just yourself”), be sure to include a small gift to thank the hosts for including you in this special tradition. On a day that’s already filled with delicious foods and bordered by a holiday steeped in gift-giving, it is hard to find just the right thing to thank someone for all the thawing, brining, roasting and washing up they’ll be doing. 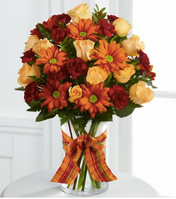 Make it easy by choosing flowers that will not only be lovely on Thanksgiving day, but will continue to have your hosts thankful through the coming weeks. Paperwhite bulbs (Narcissus papyraceus) are the perfect plant to present on this day of gratitude and stuffing yourself. A close relative of the daffodil, paperwhite flowers grow from small, teardrop-shaped bulbs. Easy to grow and available from florists and garden centers beginning in November, these beautiful and fragrant flowers can be grown from bulb to white, willowy blooms within about 3 to 4 weeks time. You can purchase a pot already planted or easily make one on your own with a low, glass dish and a bit of gravel. Simply choose a container and fill it half full with clean, loose rocks or pebbles. Place the bulbs, pointy side up, and cover with more gravel until only the very tips of the bulbs are visible. Add water until in comes almost to the top of the bulbs and wait just a day or two. When they come in contact with the water, the round, brown bulbs begin to awaken and send up the tender, green shoots of leaves. This is the perfect time to present them as a hostess gift. Over the next few weeks the leaves and stems of the plant will grow just a bit each day until the buds burst open to reveal the dainty, white flowers. Bring them over when they’ve just started to emerge from the bulbs and your hosts will have the pleasure of watching them grow and develop over the next month. 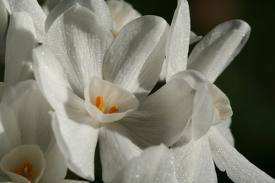 Paperwhites are prized for their fragrance, which has a powdery, fresh smell. Each stem is topped with a cluster of miniature, daffodil-like flowers which will last for more than a week. During this time, their scent will fill a room with fond memories of you and your thoughtful gift. Want to make an even longer-lasting good impression? Be sure to help with the dishes.